The Amgen Tour of California will return to Sacramento, the Capital of California, for the start of the ninth edition of America's largest cycling race announced AEG, presenter of the race. The eight day stage race will return to a route traveling north-to-south on May 11-18, 2014, along more than 700 miles of scenic roads through some of California's most picturesque backdrops. 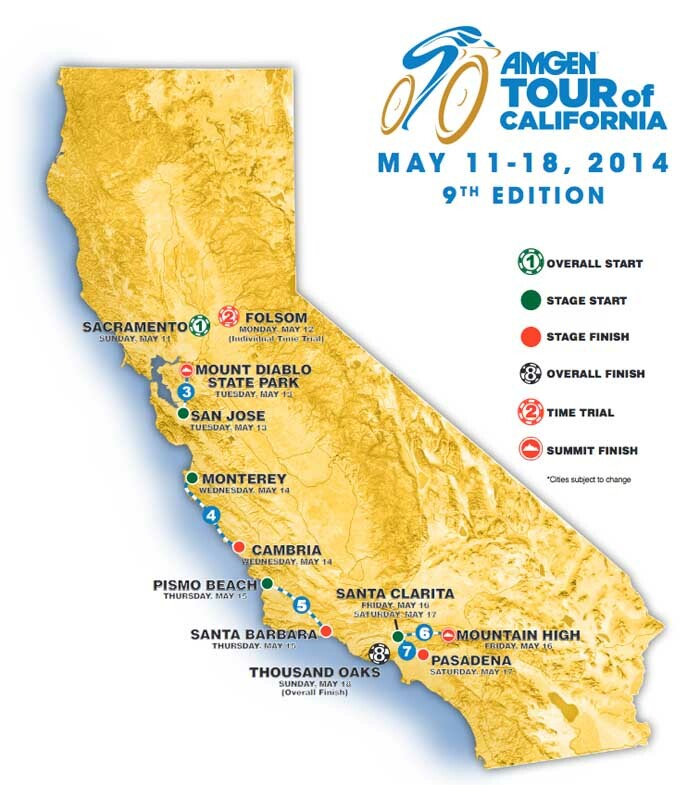 Considered America's largest and most prestigious cycling event, the overall start of the Amgen Tour of California will begin in front of the state's Capital Building and travel through 11 host cities during the eight day event including Folsom (first time host city), San Jose, Mt. Diablo, Monterey, Cambria (first time host city), Pismo Beach (first time host city), Santa Barbara, Santa Clarita, Mountain High (first time host city), Pasadena and Thousand Oaks. The following day, the Individual Time Trial (Stage 2) will see racers competing against the clock in the former gold rush city of Folsom, which makes its race debut this year. For Stage 3, the peloton will return to California's third largest city, San Jose (the only city to have participated in all nine editions of the race), for a stage start before traveling more than 50 miles north, gaining altitude as the route winds up Mt. Diablo for mountaintop finish at the famed summit for the second consecutive year. Santa Clarita will host the Stage 6 start, before riders head to Mountain High for another mountaintop finish. The peloton will return to Santa Clarita for the Stage 7 start and will finish that day in the historic town of Pasadena.